On Friday, July 20, 2018, 400 people, representing 32 organizations, marched from the Roundhouse to the Convention Center where some of the Nation’s Governors were meeting (with lots of their staff and personnel). Their demands and a few pictures are attached. See Santa Fe New Mexican article here. In the early evening, while the Republican Governors were drinking at a cocktail party on the roof of the Drury hotel some Santa Feans erected an“END ICE” visual message in direct line of sight at the Cross of the Martyrs.To view a short clip of GOP Governors partying at the rooftop bar and ICE Protest atop Santa Fe’s Cross of the Martyrs, click here [dropbox] (1). Then at nightfall the Governors and their respective entourage had a spectacle performance of a New Mexico traditional festivity celebrating old man gloom, reactivated (in off season) especially for them. 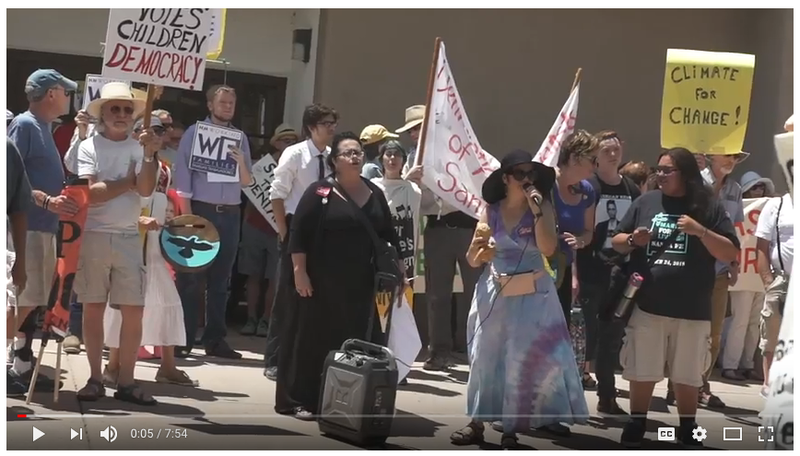 Except there was an “unofficial” Zozobra – one fired up against TRUMP, his destructive racist and inhumane policies and, in particular, a Trump effigy burning with an “END ICE” just hundreds of feet away from the “official celebration” on private property. A citation was issued to the homeowner for having an un-permitted fire while regional burn restrictions were in place. Activists felt a counter spectacle was necessary and had fire blankets, water, extinguishers, and a certified firefighter present during the action. “The symbolic burning of the Trump effigy to gain attention to the cruel arrests and detentions by ICE agents of immigrant children and families was necessary to try to prevent the greater harm that that will continue if ICE is not stopped. Mover a small fire can be used to prevent a bigger fire and Trump and his underlings are burning up the world – with the Southwest immediately threatened with heat, drought, wildfires and water shortages,” stated Attorney Jeffrey Haas.